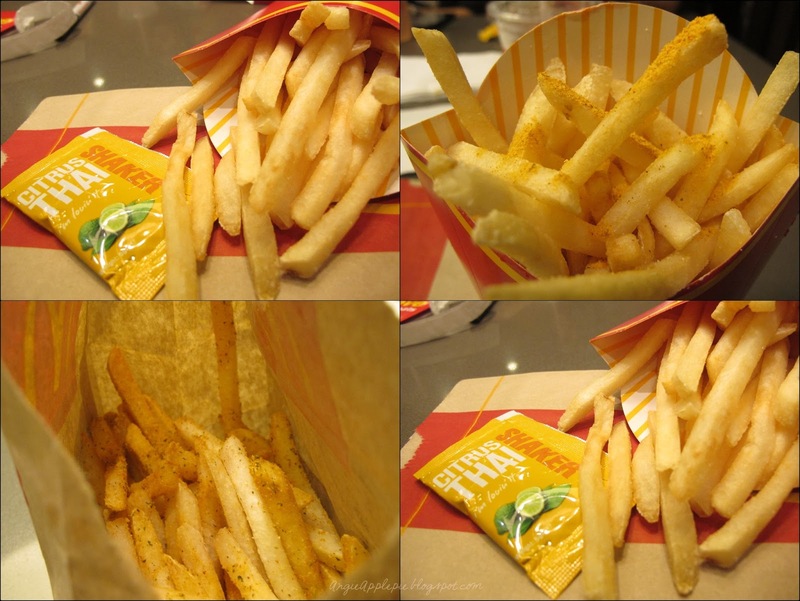 Angie | ♥ yourapplepie : Sponsored review : McDonald's Black Pepper Flamer Burger + McFizz + Citrus Thai shaker fries. Sponsored review : McDonald's Black Pepper Flamer Burger + McFizz + Citrus Thai shaker fries. Very privileged to be one of the few bloggers to be able to try out the new treats from McDonald's last Sunday. We were literally the first few to try out ,even the staff to have yet to try them. We were also there with 50 lucky Mcdonald's Facebook fans as well. ( now you know where can get free food huh ) By the way I always thought that McDonald's Facebook page was fake, now I know they are actually real hahahaha. This reminds me of the powder of tomyum instant noodles. It tastes like Tomyum minus the spiciness. The black pepper flamer is inspired by the black peper spice and it tastes much like a piece of tandoori meat. It reminds me of... mustafa . The burger bread was good. We had both burgers because we had a spicy face off that day! We were asked to vote for the mightiest burger. A ball for us to vote for our favourite burger ! Both Xueling and I picked Black Pepper flamer ! The black pepper flamer burger together with the citrus thai shaker fries will be available in McDonald's Singapore outlets this thursday (18 April 2013) Limited offer so remember to go try it. Ending off with a group picture of the us bloggers!